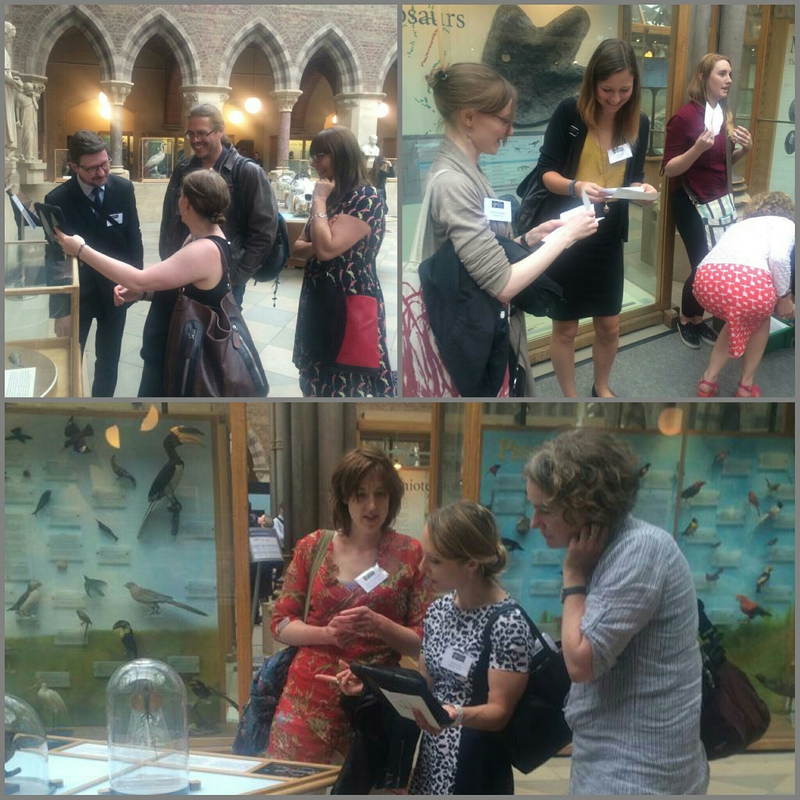 On 22nd July 2015 we welcomed over 100 delegates from across the UK to the Museum of Natural History in Oxford for a one day conference dedicated to in-gallery engagement techniques which I programmed as part of my role at Oxford University Museums. With the increasing focus on mobile apps and digital interactives, we wanted to get to the bottom of what makes a good gallery interactive, digital or ‘analogue’, what engages audiences and leaves them excited about the collections, rather than the medium of delivery. We started the day with a session on tactile engagement, beginning with a talk from Ted Koterwas, who shared insights from a number of pilots currently being rolled out across Oxford University Museums – at the museums we regularly collaborate with Ted and his team in IT Services’ Mobile Development Team. One nice case study was a new prototype app developed with the Bate Collection of Musical Instruments, which is unique as a museum in that it has a playing collection, with instruments lent to members of the university, for practice and performance. 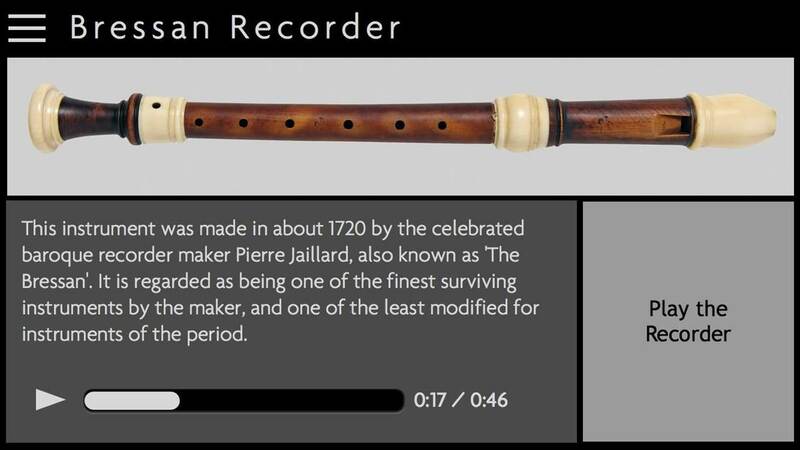 The app extends this experience to the general visitor: using samples, users can blow, strum and pluck their touchscreen to replicate the sounds of the instruments. Next Xinglin Sun from the Royal College of Art shared a research project she worked on at the Sir John Soane Museum focussing on haptic engagement. Xinglin created a handling box containing five different pieces of building materials from the museum that both correspond to the visitor’s pathway trough the space, and periods or Sir John Soane’s life. Visitors are encouraged to hold the pieces while connecting with associated stories, utilising the tactile engagement to illicit emotional responses and deepen engagement. Finally Andrea Mercer from Derby Museums spoke about the Re:Make community collaboration project at Derby Silk Mill. The project started a few years ago to literally remake the museum space as a community co-production project, with members of the public designing and constructing everything from the seats in the café to the display cases in the galleries. Andrea focussed on the most recent phase of the project to create a new Nature Gallery. A key part of this was working with the public to produce interactives such as magnifiers and torches that were designed to help people interrogate and look differently at the specimens – this was a complicated process but the community loved being part of that journey. Session two focussed on how museums can tell stories in their spaces, and began with a talk from Katherine Biggs and Ina Pruegel from Historic Royal Palaces. The palaces have great stories to tell, but there is often no route in for the uninitiated. HRP has previously had success unlocking these stories in the physical spaces using guides and actors to bring the stories to life in a way that balances fact and fiction to create an immersive experience; but this is intensive and expensive, requiring event planning, actors and impacting on visitor flow. Looking for alternatives, Katherine and Ina explored whether the mechanics of games could help. This led them to create Digital Missions, a character-led interactive adventure, using the same narrative principles and challenging the user to progress through a series of challenges. Next Antonia Harland-Lang from the Museum of Oxford looked beyond the walls of the museum and presented on the East Oxford from Above project. Part of a larger English Heritage project called Britain from Above, Antonia’s project engaged local audiences with aerofilm collections in the museum’s archive, inspiring them to respond creatively to their local environment and promote pride in their local heritage. Antonia ran a myriad of engagement events, working with members of the community to interpret photos, create videos, and ultimately put together a community curated exhibition. The result was a highly interactive display where visitors were asked to go deeper through a memory sound station and iPad interactive, and continue to leave their own memories on the map. Over lunch delegates were invited to try some new interactives in the Museum of Natural History, one digital, one analogue. 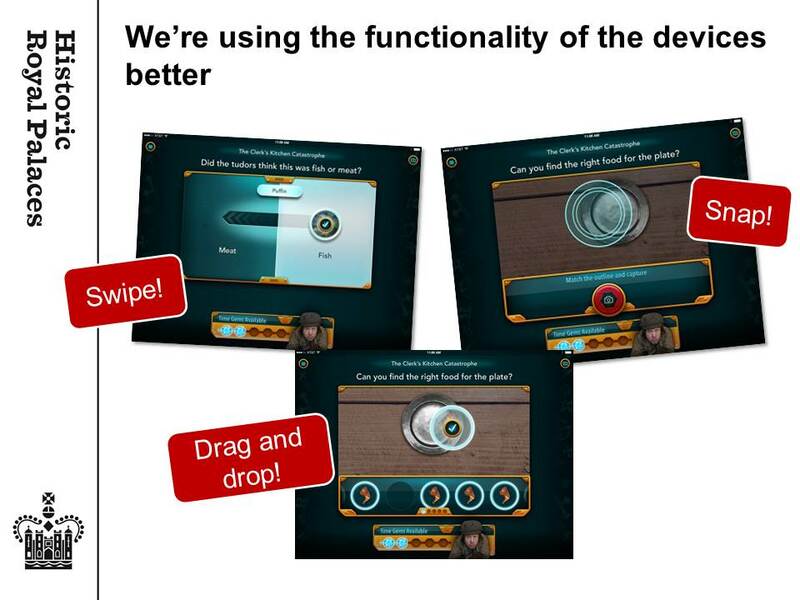 On the digital side was the new Sensing Evolution app developed for school groups. Linked to new specimen touch tables in the museum court that are designed to tell the story of evolution, the app links out to other objects in the collection relate to evolution. Students are sent out to find the objects, unlocking video content – presented by Steve Backshall for primary students and Alison Roberts for secondary students – answering questions to unlock the next step on the trail. On the analogue side was a tour developed by Oxford student group Talk-a-Bout, aimed at adults but with a twist. Envelopes contain cards related to different objects in the collection centred around a theme, but users aren’t just asked to consider details of the object, but to consider how it relates to their own lives, how it makes them feel, what memories this evokes, and share these thoughts with their companions, adding a deeper personal level to the experience. Session three focussed on families and schools. The session began with a talk from Hannah Lake and Aleksandra Zaczek-Gbiorczyk from the Royal Collection Trust on developing The Biggest Best Tour of Buckingham Palace in the World… Ever. As a working palace, imbedding permanent interpretation is a major challenge, so audio and multimedia guides are an excellent tool to enable the team to tell visitors about the history of the collections on display, the history of the royal family and palace, and the story of what happens in a modern working palace. The team have been focussed on developing something for younger visitors that speaks in a voice they can engage with and understand, and keeps them engaged through games, quizzes and other interactives. Hannah and Aleksandra shared some of the lessons learned from the development and evaluation process. Next, moving the focus to schools, Helen Ward from the Ashmolean Museum talked about the Digital Sketchbooks project which helps students and teachers use iPads to enhance an art education visit to the museum, allowing students to complete their inspiration gathering quicker and therefore make more of their time in the museum, and allowing all students, regardless of their skill level, to produce something creative as part of their experience. Helen gave examples of using iPads in practice, sharing experiences from a Trade and Exploration day. The learning aims were to understand the reasons for voyages of discovery and the subsequent impact that they had on Western society. The activity started with an object handling session, and then student used the iPads to collect objects on display in the museum to create an 18th century country house interior of their own. 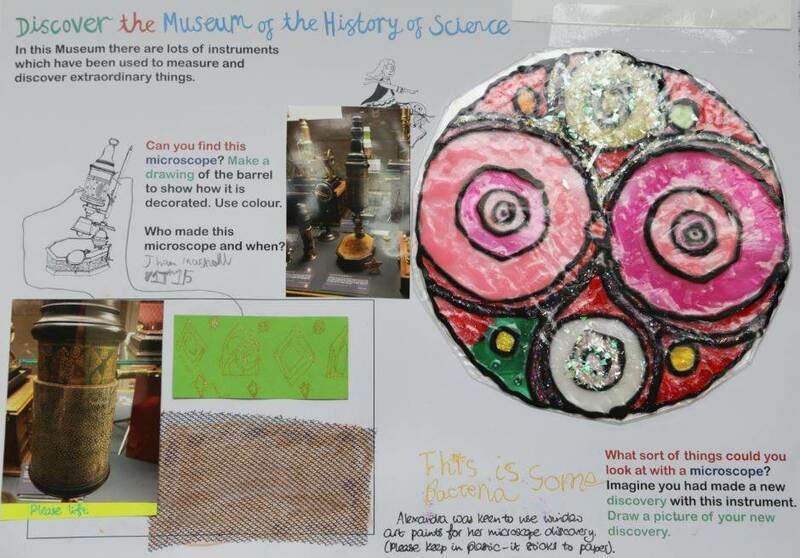 This was an effective activity as it encouraged the students to think about the context of the objects and what they were originally used for, and use their own creativity. The final speaker in this session was Miranda Millward from Oxford University Museums who spoke about adapting the established programme of family friendly events at the museum to deliver Arts Award. The museums have run a successfully programme of family friendly events for many years, and the project aimed to offer a framework to utilise this programme to support young children in achieving an Arts Award certificate. What results was a logbook designed to cover all the assessment criteria of a Discover Arts Award. The consensus among the audiences is that we all wanted our own logbook to complete. The final session of the day looked at permanent displays. The session began with a presentation from Kate Osbourne from the Royal Albert Memorial Museum looking at the various interactives, analogue and digital, in their gallery spaces, both the success and the duds. This was followed by a highly entertaining and enlightening talk from Chris King from the National Maritime Museum. Part of the technical team, it is their job to maintain all the interactives, both digital and analogue, in the museum spaces. Chris’ talk highlighted the need to consider how new interactives fit in with existing systems and how they will be maintained in the long term. 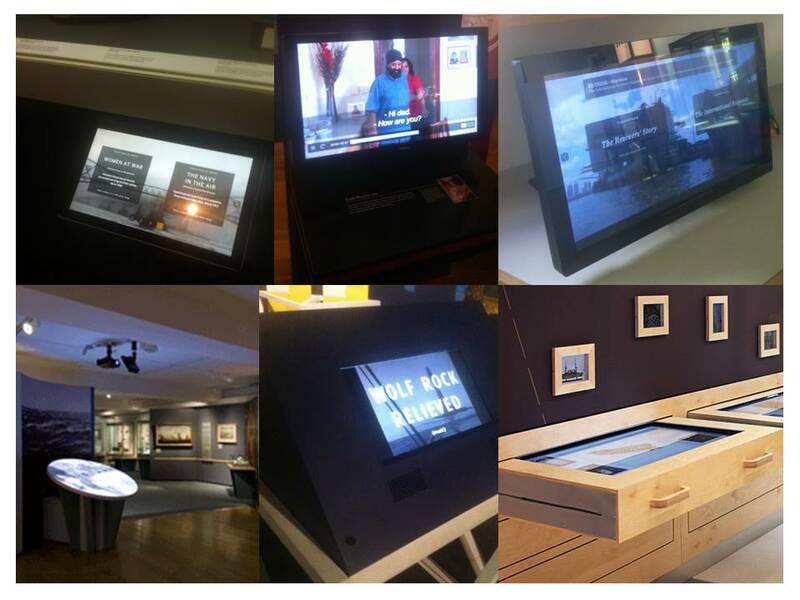 Too many museums have multiple different brands of touch screen – some of which are pinch and others tap, working in different ways that confuse audiences – all running on different operating systems. Also, there is a plague of interactives developed by external companies that make their way into museums without proper documentation and need to be ‘hacked’ when problems arise. A fascinating journey through interactives ‘in the wild’, Chris’ talk was a reminder to consider the sustainability of new interactives. 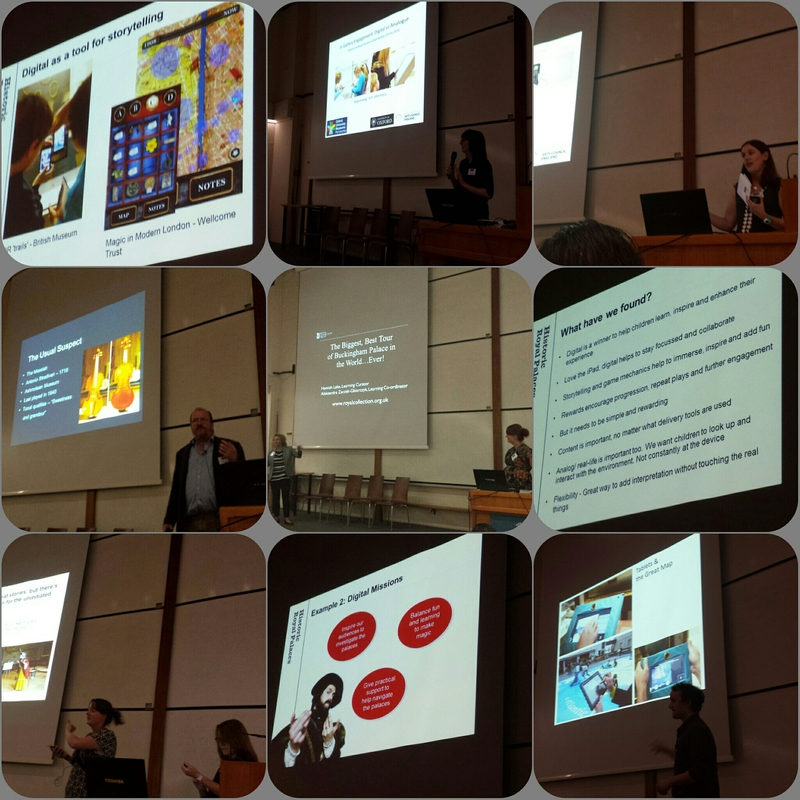 We finished the day with a presentation from Matt Kimberly from the Bodleian Library about the Samsung screens installed in the new Weston Library developed as a donation in partnership with Samsung, sharing both the benefits and challenges of this way of working. Overall the day appeared to be a success, with significant knowledge sharing happening over Twitter #DigvsAnalog, and finishing up with a lively Drinking About Museums – always a win. This entry was posted on September 12, 2015 by Jessica Suess in Museums.